Bump: A player is permitted to ride into another player so as to spoil his/her shot. The angle of collision must be no more than 45˚, and the faster the horse travels, the smaller the angle must be. Chukker (Chukkar): A period of play with a maximum of seven and a half minutes elapsed time. At the end of seven minutes, a horn will sound to indicate that thirty seconds remain in the period. There are six chukkers in a match with a ten minute “halftime” after the third. Players change ponies during the short breaks between chukkers. Divoting: The traditional half-time invitation to fans to walk on the field and “toe-in” the divots made by galloping horses. This repairs the field and provides an opportunity to socialize. The Field: The regulation polo field is 300 yards (think 3 football fields end to end) by 160 yards and the goal posts are placed 24 feet apart at each end. There is a “safety zone” of 30 feet along the sidelines behind which spectators should stay. Fouls: When the umpire observes a foul, he/she blows a whistle, and the other team gets a penalty shot. The most common foul is crossing the line of the ball. Forty percent of all points in a match are scored from a penalty shot because of a foul. Goal: Scoring goals is obviously the purpose of the game. Anytime the ball crosses the line between the goal posts, it is a goal – regardless of whether a mallet or horse caused it to go through. Teams change ends of the field after every goal. Handicaps: All players registered with the USPA are rated from -2 (novice) to 10 (the best) by a committee. (-2, -1 & 0 are also listed as C, B, & A respectively). The 0 rating is average, and there are only fourteen players in the world who are rated at 10. In the U.S. only one player has a 10, and about 96% have a handicap of +2 or less. Handicaps reflect skill and the value of the player to the team, not the number of goals he or she is expected to score. In handicap matches, each team adds up the ratings of its players to arrive at a team rating. Any difference of the two teams’ ratings is awarded as points to the lesser -skilled team at the beginning of the game. For instance, if a 12-goal team plays against an 11-goal team, then one goal is awarded on the scoreboard for the 11-goal team at the start of the match. Interestingly, in tournament play, “under-handicapped” players are highly valued. Hook: A player can interfere with another’s shot by putting his mallet in the way of the striker’s swing. However, it’s a foul to hook too high or to reach over the other player’s horse. Knock-In: When an offensive player hits the ball over the back line, a defending player resumes the game with a free hit from their back line. No timeout allowed. Line of the Ball: If you don’t remember anything else about polo, remember this phrase: “The ball’s path creates an imaginary line as it travels, and the player or players established in this line—behind or before the ball – have the right-of-way on the play.” Most penalties involve a violation of the line. An opposing player may NOT cross directly in front of the player hitting the ball and can NOT cross the line without first bumping or riding off his opponent to the other side of the imaginary line. Out of Bounds: When the ball crosses the sidelines, play stops and is resumed when the umpire throws in another ball between the two teams to restart play. No timeout allowed. Penalty: Players are penalized for moves that create dangerous situations for horse and rider. Depending of the severity of the foul and where it occurred, the fouled team is allowed a free hit from a set distance from the goal. Ponies: Actually, horses selected for their speed, agility and stamina. Many are thoroughbreds under sixteen hands, and many are mares because they are more aggressive. Ride-Off: Similar to the bump, the players attempt to push each other off the line of the ball to prevent a successful hit. The horses are the ones intended to do the pushing. Shots: Players execute shots from the “off ” (right) side of the horse. With reins in the left hand and mallet in the right, the player is only holding on with his/her legs. Players stand in the stirrups when they hit the ball. Throw-In: The umpire rolls the ball onto the field between lined-up teams to start or resume play. Umpires: Two umpires are on the field, and in tournament play there is a designated third referee on the sidelines. The Helmet has a hard surface and is lined, strapped and many have face guards. It protects from the ball and swinging mallets. Polo Saddles are flatter than jumping saddles. Knee Guards are made of padded leather and offer protection. Polo Boots offer rider protection. A Braided Tail allows less interference with swinging mallets. Polo Plates are a special lightweight horse shoe that are made of iron. The inner rim is slightly higher than the outer one, making it easier for the hoof to pivot in all directions. Bandages support and protect the pony’s legs. The Mallet Head is made of tipa wood from Argentina. The ball is hit with the side of the head. The mallet is made of manua cane and is flexible. The Breast Plate keeps saddle from slipping back. The Polo Martingale prevents the horse’s head from going up and striking the player’s face. The Polo Bridle is used to control the horse. Draw Reins run from the player’s hand, through bit rings and back to the saddle, and help control pony. A Roached Mane clipped to help prevent getting tangled with the reins, as well as to prevent from getting in the player’s face. Gloves afford protection and offer a better grip on the mallet and the reins. The four polo players on each team are assigned positions, designated one through four, and the numbers are worn on team jerseys. The most experienced and highest–rated players are at positions two and three. Since polo is such a fluid game, players must be prepared to change positions as often as necessary to benefit team play. Afterwards, players always try to return to their original position assignments. Each player is expected to cover his or her man (or woman) who is the numerical opposite on the field. Position 1: This is an offensive player who is similar to a forward in hockey or soccer. An accurate hitter, he or she should be out in front and concentrating on scoring. Position 2: Primarily an offensive player, he/she should be quick and aggressive with fast ponies. He/she supports the efforts of #1, and is often the second-highest rated member of the team. Position 3: This player is like the quarterback and usually the team captain. Typically, he/she is the highest handicapped and most experienced player on the team. He/she is the pivot, and works to take possession of the ball from opponents. Good stick-and-ball control, accurate passing, and the ability to hit the long ball are essential skills. Position 4: This player is like the defensive back. 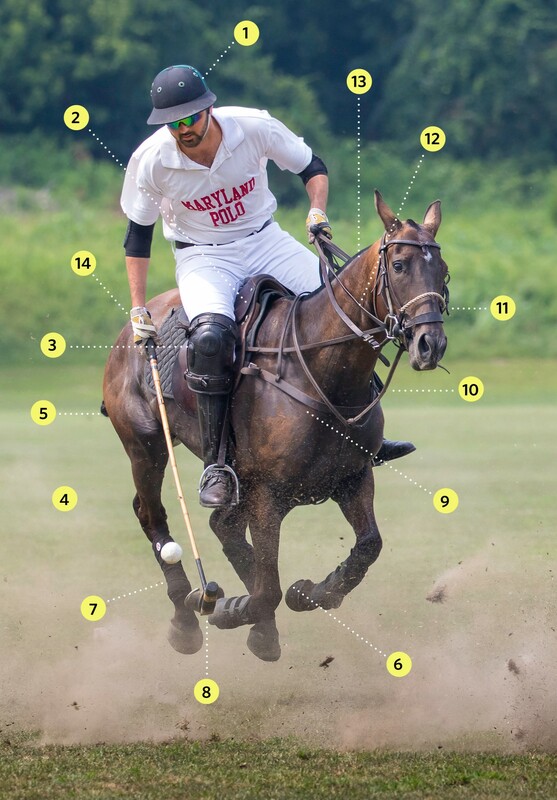 He/she is the defender—there are no goalies in polo. A Number 4 has to be capable of turning a play, often with a good back shot, and returning the ball to his teammates. Penalty 1: Team fouled is awarded a goal. The ball is thrown in 10 yards from the goal without ends (of the field) being changed. Penalty 2 (Undefended): Free (undefended) hit from 30 yards opposite the center of the goal, or from the point of infraction­—Captain’s choice. Penalty 3 (Undefended): Free hit from 40 yards. Defenders are to be positioned behind the end line and outside the goal posts. Penalty 4: Free hit from 60 yards. Defenders must be positioned at least 30 yards from the ball. Penalty 5: Free hit from center of the field, or where the foul took place. Defenders must be positioned at least 30 yards from the ball. Penalty 6: A “safety” is awarded when the defending team hits the ball over their end line. A free hit is taken by the team fouled from a point 60 yards from the end line.